If you were touched by the story of Cecil the Lion, there are many opportunities out there to help save big cats. 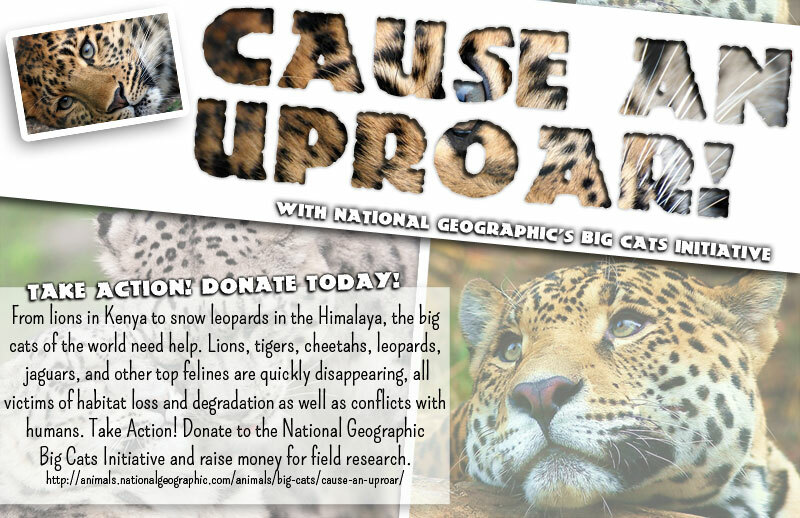 Above is a poster I created for a design class a few months back and now I can actually use it to promote awareness about the plight of big cats. I just donated to Nat Geo’s Big Cat Initiative and I absolutely love watching shows about big cats on TV, like the BBC’s Big Cat Diary. We’ve got to make sure the big cats are here to stay! Will you help? I´m touch by the poverty of humans in the world, I´m touch by terrorism, I´m touch by Iran being able to have an nuke, I´m touch by gay rights, I´m touch by me life´s struggles. Cecil, well if you put things in perspective…. Oh there are plenty of things to get touched about in this old world! Too many of them in my opinion. It’s too bad.